I think I imagined a gadget like this decades ago. A start-up called Waverly Labs, has created a device, The Pilot System, that translates English, French, Spanish and Italian in real time. I have been reading about Waverly Labs for a few weeks and then someone told me that the company will be raising money on Indiegogo. This is what I found. If The Pilot works, it will really be incredible. Supposedly, when someone speaks to you in a different languages, The Pilot ear device will translate what is being said. The device, $299, is available in three colors. 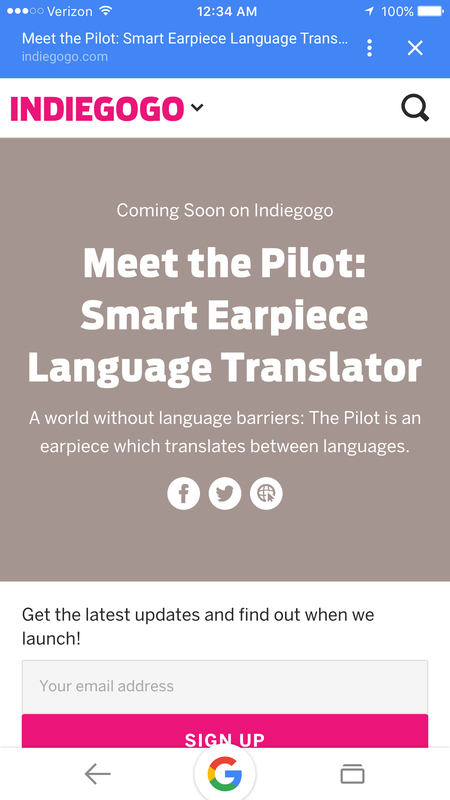 You have to download The Pilot app in order to control languages in the earpiece. Future languages include Slavic, Semitic, Hindi and East Asian. The Pilot is targeted for Spring 2017. If you want more information you can contact the Founder and CEO, Andrew Ochoa, press@waverlylabs.com, 646-480-2644. This entry was posted in digital, senior lifestyle, tech and tagged The Pilot, Waverly Labs by loiswhitman. Bookmark the permalink. Steve imagined this as well, but it seems to be a one way device. How would you communicate back to someone in a foreign country, for instance, unless they wore the device as well? What a boon to travelers! Even if it works only one-way, it would be a tremendous help.